Charlie is the group’s former singer Charlie McNary, who has since gone on to form another band, Vicious Rumours, with guitarist Scott Reid and bassist Dave Rymer, the players who took Brian MacLeod and Ab Bryant’s places on the last Headpins tour. “Charlie was a good singer,” says Gillstrom, “and he helped us to get to a good level in the club scene as far as Top 40 goes. But he was still stuck on the Top 40 thing; he wasn’t willing to go on the way we wanted to go. We argued for a while, then we told him that were going to look for someone else who wants to go in our direction. George Widule, 21, from Milwaukee, Wisconsin, became the new lead singer for Kick Axe three months ago. With his flowing mane of golden hair and patented rock posings, he helps heat up the stage when Kick Axe churns into high gear. It’s no wonder he doesn’t wear any shoes or socks. As soon as Widule joined the group, which also includes Vic Langen on bass, Ray Harvey on guitar, and Larry’s brother Brian Gillstrom on drums, they set right out on tour, traveling across the prairies to Winnipeg and then working their way back to Vancouver. “When we made it back to Vancouver,” says guitarist Gillstrom, “we started in Gators, which was a hard thing to do because heavy metal goes over there like a lead balloon. “You’ll often run into what we call a preppy situation, where the people aren’t there to listen to the band–they only want to hear songs they know so they can dance. And you can go on forever pleasing those people, but it’s not doing you any good. Maybe you can make heavy metal work anywhere, because Kick Axe have established quite a following among Vancouver’s hard-rock fanatacs. And now that the’ve found a new, more unified direction, there’s no telling how far they’ll go. 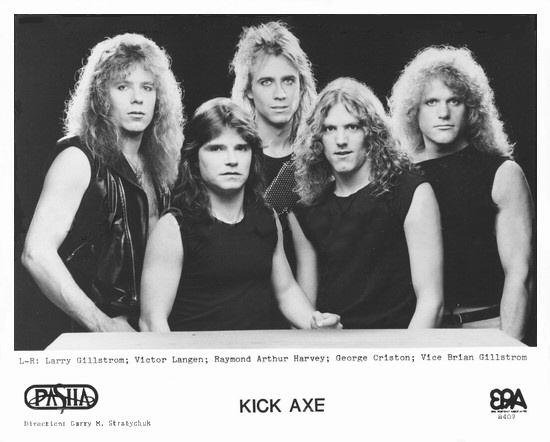 According to Gillstrom, groups like Kick Axe have a hand up on other bands because their fans, mostly young, are more devoted and emphatic about what they like. Because the members of Kick Axe realize that heavy metal is mostly a younger person’s music, and that the age limit at clubs ban a large portion of would-be fans from ever seeing the band, they will be performing an all-ages concert at the Roxy Theatre on Sunday, April 24. And considering the band’s current enthusiasm, it should prove to be quite a show. KIller band, great guys. They rocked the hell out of the Scottsdale Inn and it wasn’t just the “young” guys that dug them. Phil, are you talking about Delta BC, Scottsdale Inn? Any idea when it was? I work on the Kick Axe project (kickaxe.wz.cz).